Is there a better alternative to DeskPics? Is DeskPics really the best app in Desktop category? Will DeskPics work good on macOS 10.13.4? DeskPics is a quick and easy solution to taking screenshots on your Mac. Folder shot lets you take snapshots of selected windows. Use Partial shot to take snapshots of partially defined areas on the desktop. 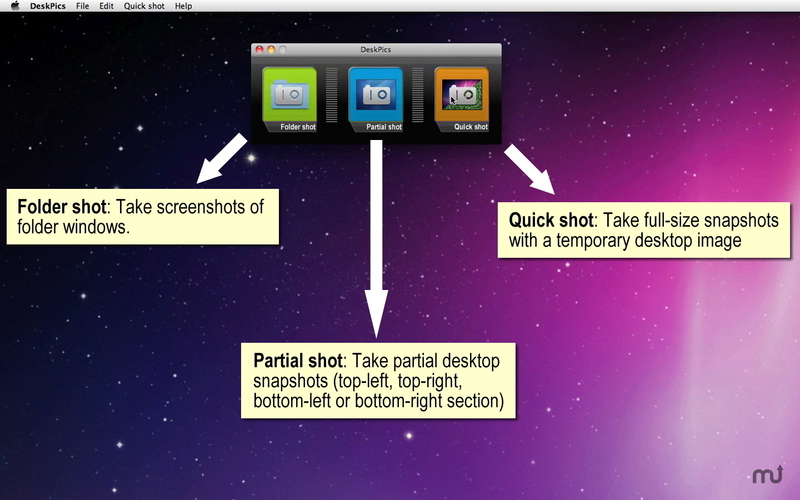 Finally, use Quick shot to take full-size screenshots with a temporary desktop picture. When you are finished, DeskPics will set the original picture back. Please note that the price will be raised to 19.99 when we release ver. 1.2.0 in July 24th. DeskPics needs a rating. Be the first to rate this app and get the discussion started!